This blog was originally posted on April 20, 2016 on the U.S. Green Building Council’s website. It is republished here with their permission. The Climate Leadership Awards are presented by USGBC’s Center for Green Schools and Second Nature. The awards recognize innovative and advanced leadership in sustainability, climate mitigation and resilience at signatory campuses in the climate leadership network. USGBC caught up with last year’s honoree in the Two-Year Institution category, Western Technical College in La Crosse, Wis., to check on their progress and accomplishments to date. Since receiving the 2015 Climate Leadership Award at last year’s Greenbuild, we have seen a peak in interest in Western Technical College and in our sustainability efforts. The national attention acknowledges that we are doing something special, and there is a level of respect that comes with it. Legislators, industry leaders and other educational institutions have taken note of the great strides we have made to reduce our impact on the environment, and the recognition has provided a platform for us to make a difference and implement change in our community and beyond. Most important, the efforts taken to qualify for the award have generated pride among faculty, staff and students. Since signing the American College and University Presidents Climate Commitment in 2007, Western has made substantial progress in our climate leadership journey. In 2015, our energy conservation efforts reached the milestone of $1 million in certified energy savings. While Western’s five LEED certified buildings are impressive, we are equally proud of the state recognition we receive for our successful recycling campaigns. By focusing on buildings as living laboratories, Western students are getting training on state-of-the-art technology. Western owns a passive house that provides a hands-on learning environment for students in five different programs. We also own a dam with a hydro power station that produces 1 gigawatt of power each year. Also, students have created a computer dashboard program that tracks energy usage of campus buildings in real time. Our newly completed Integrated Technology Center will be one of only 16 LEED Platinum buildings in Wisconsin. This is particularly noteworthy, since this center houses the college’s equipment-intensive manufacturing and building systems programs. 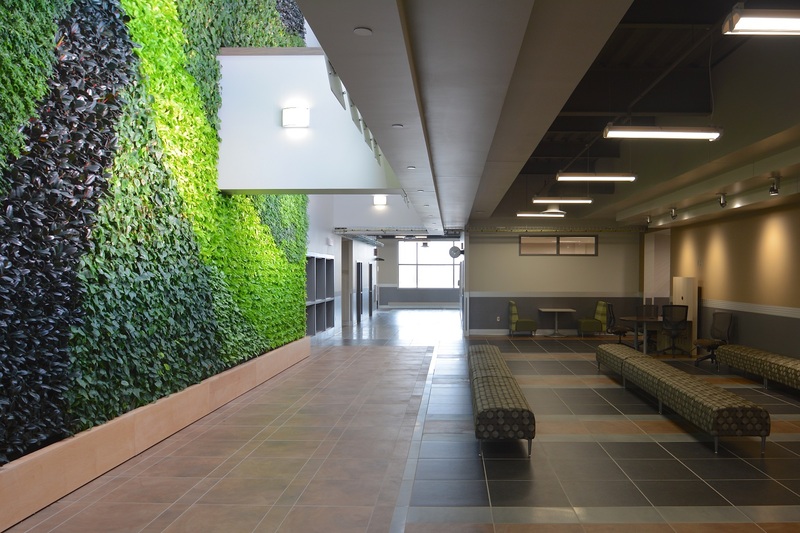 The “Green Wall” in the Integrated Technology Center. These live plants are maintained by Western’s Landscape Horticulture students and serve as the artwork for this student study space. Image courtesy of HSR Associates, Inc.
An advantage to being an educational institution is that these facilities are open to the public. We have the opportunity to serve as a role model for our community, demonstrate how this technology can be used on smaller scales and still have a big impact. Regular tours, certificate programs and business and industry training opportunities expose community members to the possibilities for energy reduction. In addition, it opens to the doors for many unique partnerships. A newly completed greenhouse on campus houses the “Get Growing” initiative between Western, the Hillview Urban Agriculture Center, and Mayo Clinic Health System–Franciscan Healthcare. The purpose is to instill healthy eating habits, promote local food sourcing and foster education about gardening, agriculture and sustainable practices. Western also serves as the host for the Sustainability Institute, a regional nonprofit organization that promotes environmentally sustainable practices through education and technical assistance to area businesses and community organizations. Our college’s commitment to serve as a community leader in environmental sustainability is at the forefront, and the national recognition has given us reach beyond our district and significantly reinforced our internal efforts. We are honored to be the recipient of the 2015 Climate Leadership Award, and we encourage others to apply and experience the benefits that accompany this acknowledgement.